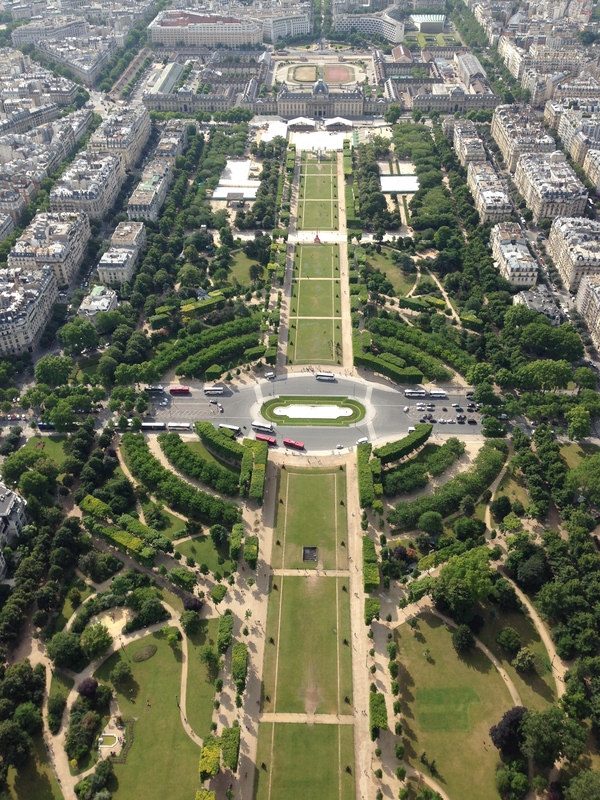 Oh, the view from the Eiffel Tower… lovely. As many times as I have gone, I can’t seem to get enough of it. I have a couple of tips for making your visit a little less stressful. As you see, we had the sun in our eyes for this shot. When you are planning your trip to Paris, you can purchase your tickets to go up the Eiffel Tower well in advance. I *highly* recommend you do this. You can purchase your tickets by visiting: http://www.toureiffel.paris/en/preparing-your-visit/buying-your-tickets.html. Book your tickets early, they sell out online months in advance. If you wait until you get there, you will end up waiting in a very long line – even if you get there well before it opens. The line can last hours if you wait to purchase the ticket. There are a couple of lines you will wait in. The first is the ticket line (the longest line of all). It snakes around the bottom of the Eiffel Tower, packed full of people. You will then be harassed by people selling illegal merchandise and others (Roma Gypsies) begging for money. The Roma have cards that state they are trying to get back to their country (they will hear you talking and hand it to you in whatever language you are speaking), it is usually a woman. They just want your money – they are definitely not trying to get back to Romania. You will also find men with some sort of a “disability” wanting money, as well. I tell them “no” and don’t let them approach me. You will also need to be concerned with pickpockets while waiting in line (another reason not to take money out in front of the people begging for money). When purchasing your ticket, you will need to decide how high up you would like to go. 1st & 2nd (elevator goes up to the 2nd floor and you can walk down or take another elevator down to the 1st), or 3rd. The higher up, the more it costs. You’ve dodged the pick pockets and people begging for money, you’ve purchased your tickets or had them already purchased online prior to your visit (you will have reserved a time to show up with a copy of your print out), it is now time for you to get on the elevator (I’m assuming you want to take the elevator up. You can walk up the 5 million stairs, if you would like.) The elevator will take you to the 2nd floor. If you would like to go to the 1st floor, you will need to take the stairs or another elevator down. You can explore around the 2nd floor, take pictures, visit a shop, etc. If you had purchased a ticket to take you to the 3rd floor (the top), then you will need your ticket and get into another line. There is a place where you can purchase a ticket to take you to the 3rd floor, if you had originally purchased a 1st/2nd floor ticket and then had changed your mind. You will get in the line and wait for another elevator to take you to the top. The view from there is *AMAZING*. You can see forever. After you’ve explored all you want on the 3rd floor, you take the elevator back down to the 2nd floor. You can walk down steps to take you to the 1st floor, and then hop on the elevator to take you back to the ground. I like the steps (on the way down), it makes you feel like you are really in the Eiffel Tower. 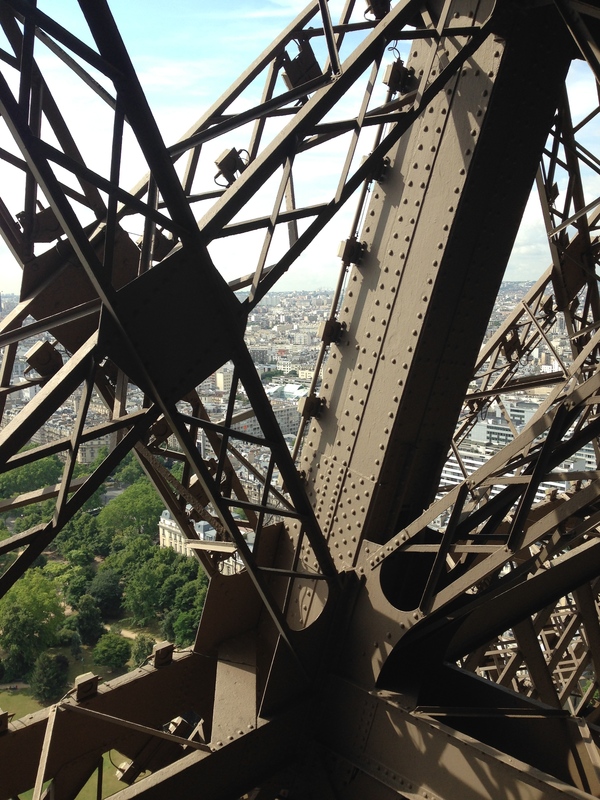 You are surrounded by the metal workings and get to see the “guts” of the Eiffel Tower. If you are around the area at night, you can see the Eiffel Tower sparkle. On the hour, all kinds of little lights flash on the tower and make it look like it is twinkling. It is really pretty. 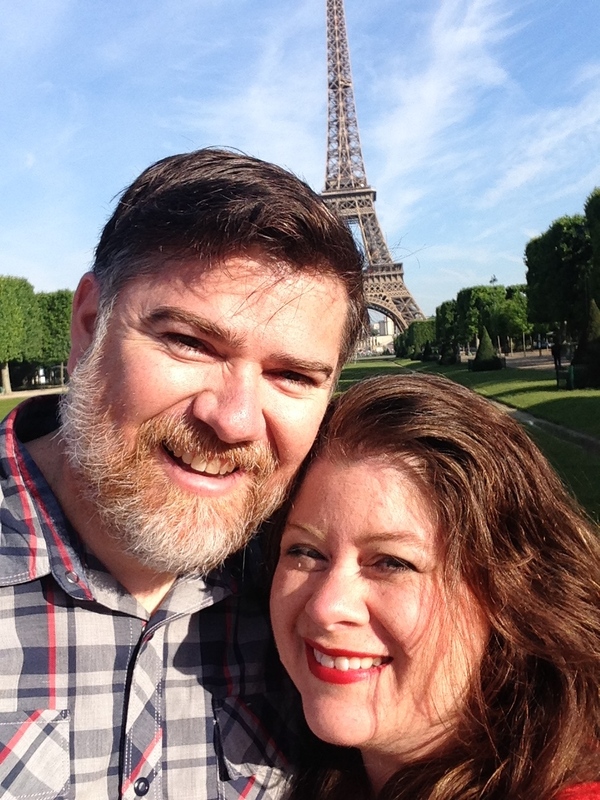 It is a fantastic experience, if you happen to be headed to Paris, I highly recommend you visit the Eiffel Tower. Oh, life never stands still. I can’t even stand still. Look! 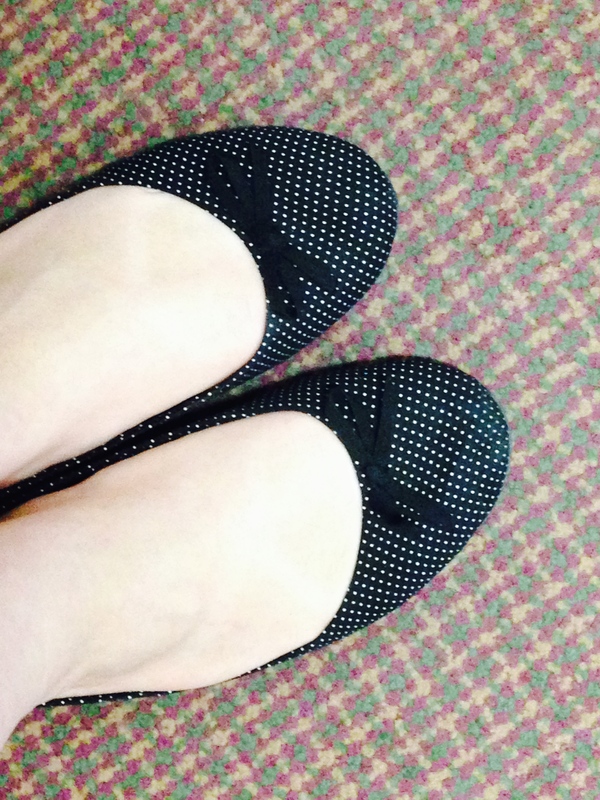 I stood still long enough to take a picture of my feet. Don’t get used to it… I’m always on the move and can’t sit still for too long. After 20 years of being a military family, we can’t stay in one place for too long. We are always looking to move up and explore somewhere else. Barefoot Runner and I both got new jobs – back in the States. I love living abroad. I love the opportunities it brings. I love the travel. I love saying, “oh, I’ve been there”. I also need to have a career. Sometimes, careers lead us somewhere else. This time, it is leading me to Virginia. Oh, I love D.C. I always have stated that I have a short list of places that I’m willing to move to when it was time for me to go back to the States: D.C. and Austin. I told you it was a short list. 🙂 Austin is great! The music, the vibe, the fantastic atmosphere. D.C. well… the history. There is a different vibe there. In Austin, it is laid back.. D.C. is very much LESS laid back, but the history, the sites, the craziness (and I’m not just talking crazy politicians). Although I won’t be living or working in D.C., I will be very close. Okay… what should be coming up: the whole shipping a car from Germany to Baltimore experience (requesting/receiving quotes, decisions-decisions, paperwork, shipping, and finally picking the car up), purging the house from unwanted “stuff”, moving into a new house and starting my new job.